St Joan of Arc was born into a peasant family at Domremy, North East France. The family owned about 50 acres (20 hectares) of land and her father subsidised their income by performing local community roles. St Joan had her first vision at the age of twelve. She was alone in a field when Saint Michael, Saint Catherine and Saint Margaret appeared and asked her to join the struggle to remove the English from France and restore its faith; other visions were to follow. After much persistence, St Joan, age 16, was allowed entry to the Royal French Court at Chinon and made a remarkable prediction about a French military victory near Orleans. At that time fighting between England and France (Hundred Years’ War) had devastated the country and “the future of the entire French kingdom hung on the fate of Orleans”. St Joan joined the army making it a ‘religious war’ and “in an astonishing series of victories the tide of war was reversed”. 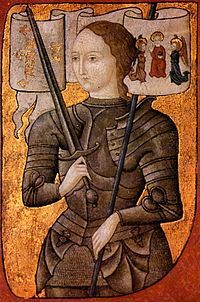 In 1430, St Joan was captured by the English and tried for heresy (violation of Christianity). At her trial in 1431, she was deemed guilty and condemned to death. St Joan was tied to a pillar and burned on a wood pyre; she was 19 years old. A posthumous retrial of St Joan was carried out after the war ended; she was declared innocent. St Joan is the Patron Saint of France. Her Feast Day is the 30th May. Pray for us that we will persevere in our efforts to uphold the teachings of our Risen Jesus.